Today's bride has very little in common with the shy and sheltered young woman beloved of eighteenth century novelists. The woman who is planning her wedding this year does her communicating on the Internet, and lives an active lifestyle juggling career, social and personal interests. The one thing she shares with the bride from an earlier century, however, is the deeply held belief that her wedding day should be absolutely perfect. And "perfect" for a modern day bride means a wedding that is increasingly creative and personal. Today's weddings are crafted and presented as carefully as stage productions. What makes it possible is the incredible number of wedding styles a bride can choose from and the corresponding array of fashions available to her. And to help her pull it all together, creatively and with ease, is the expert guidance of a professional florist. A major new development is the choice of flowers for the wedding being used to underscore and enhance the general motif of the day. According to the Society of American Florists and the American Institute of Floral Designers, three popular bridal trends with new interpretations are emerging: royal garden, romantic sophistication, and contemporary chic. Gently shaped wedding gown of silk voile, slim silhouette , widely scooped neckline, slightly lifted waist, fullness to the back ending in a small train. A summer pavilion, stone urns on pedestals, garden trellis woven with flowering vines. 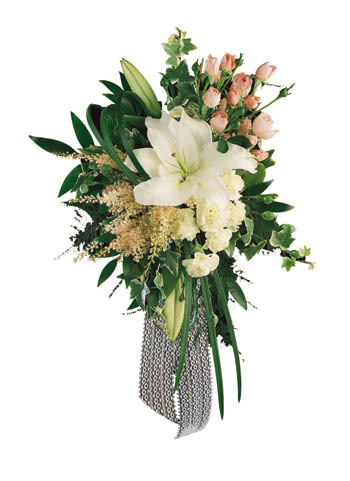 Flowers with an old-world European garden flair such as, fragrant and regal Casablanca lilies combined with peonies and astilbe enhanced with a french-braided ribbon. A smoothly fitted lace wedding gown with an overskirt of filmy tulle bursting into fullness just below the waist. Circular tables double-draped with short cloth over long; silver candelabra entwined with foliage. An abundance of soft, romantic roses or a single Duchess rose bud centered in a cluster of individual rose petals highlighted by variegated ivy and silk streamers. Body-conscious column cut completely on the bias with trumpet hem in four-ply silk jersey, penne velvet or matte finished satin. Low light, high ceilings, jardinieres on fluted columns, glass-top tables with architectural bases, champagne flutes. Simple, yet dramatic... pristine callas as the major design element, unexpectedly combined with freesia and punctuated with lily grass. Within these three newly interpreted trends, as well as many others, each can be personalized. By working with her florist, the bride-to-be can start to paint the picture of her "perfect" wedding day and feel confident that it will be carried out with elegance and ease by a professional who knows how to beautifully translate her personal style. Before contacting your florist, select the date, time and place for your wedding and reception, and know the colors and style of the gowns you and your bridesmaids have selected. Look through bridal books and floral guides. Sketch ideas, cut out pictures or take photographs of flowers to show your florist. By sharing your ideas and personal style, your florist will be able to translate your concepts and special requests into workable floral designs and arrangements that are just right for you. Set up an initial consultation with your florist to discuss specific design ideas that fit both your personal style and budget. 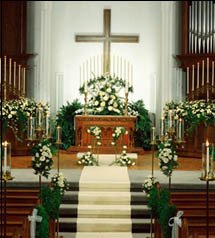 Make arrangements for your florist to visit both the ceremony and reception sites. Before leaving the first consultation a second appointment should be planned to review recommendations and budget. Adorn the ceremony entrance with flower-filled urns (move to reception later). 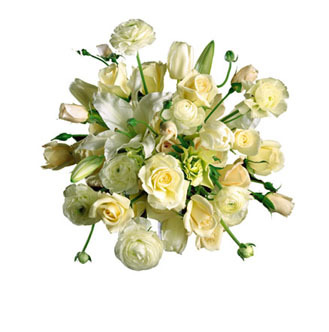 Use a single rose to mark the seats of both the groom's and bride's mothers. Garland the center of the head table with flowers and foliage; add votives. 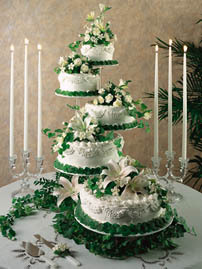 Use bridesmaid's bouquets to create a more lavish buffet table decoration or to surround the cake. Have your florist create guest table centerpieces with 4-5 separate clusters of flowers so that each couple can take a centerpiece component home. 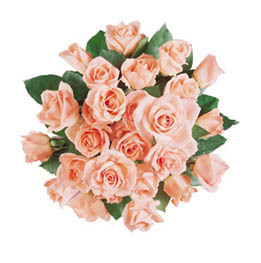 Float large fragrant flowers such as open roses or gardenias in crystal containers with votives. Sprinkle rose petals on the cake table and walkways; toss rose petals instead of rice. Have the "throw-away" bouquet double as a cake top.